If you are confused about rabbit fur, you are in good company. It is a complicated issue that I will probably continue to learn about for years. Several of the prominent breeders across the country replied to my requests for information by saying that they just don’t have much of a clue about such subjects as molting and optimal fur conditioning. Having said that, I’d like to share what I have learned from my own observations, from research, and from the more experienced breeders who were kind enough to share their knowledge with me and thus you. 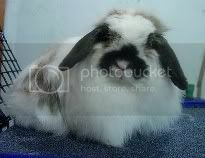 Rabbit fur is one of the least clear-cut issues facing a Holland Lop breeder. There is consensus on a few issues (change of feed triggers molts, genetics play a large role in fur condition), but widely varying opinions on others (percentage of protein in feed, best supplements). “Keep plugging away at it,” seems to be the best advice. Be willing to share what you learn to help promote and improve Holland Lops. And please, as always, let me know if there is anything that can be added or updated to make this page more useful to Holland Lop breeders! The first step is to look at the end and determine what we are trying to achieve with our Hollands fur. Our standard calls for the fur to be glossy, dense, and fine in texture. Holland fur should be approximately one inch in length and the length should be uniform. If you run your hand over the fur from hindquarters to the shoulders, the fur should gradually return to it’s normal location. If the fur springs back, it is too short. If you must smooth it back, it is too long. The ears should be completely furred. I’ve seen Hollands who lack fur on the back half of their ears, even when they are in their best fur (okay, it was in my own barn, I confess!). I’ve seen others that have splotchy ears. Well-furred ears are a very beautiful part of a nice Holland. I like to see a Holland with a nice rich, thick ruffle or skirt of fur at the lower hindquarters. It helps give the Holland a solid-to-the-table look and makes a full Holland feel even fuller at the lowest part of the hindquarters. I must note at this point that fur counts for a total of seven points out of 100. With Hollands, a bunny who has a little bit of a fur problem but great type should show better than a bunny with great fur that has poor type. Color and markings of fur scores points in their own category and counts for four points. When you are evaluating your Holland’s fur, be sure that your broken Hollands have some color on the ears, nose markings, and around the eyes. Complete absence of color in any one of those places is a disqualification from showing. Poor markings is a fault, but, since there are so few points allocated, a small fault. Next Article: How is baby rabbit fur different from adult coats?